Each day I've been checking tiny little spouts, spritzing them with water and waiting for the last empty soil pods to show signs of life. Winter returned to Raleigh, North Carolina this week, thanks to Sir Walter Wally the Groundhog, so I've not been able to bask in the sun on the small brick patio in the garden. I'm hoping that winter remains kind to the small lettuce seedlings that are sprouting outside. I've planted quite a variety already: English lavender, Italian oregano, Black Krim tomatoes, Costoluto tomatoes, purple and green tomatillos, purple and green artichokes, Farmer's Market blend lettuce, baby leaf spinach, baby butterhead lettuce, leeks, giant parsley, persimmon tomatoes, basil, Aunt Roby's German green tomatoes, red and pink tomatoes from last year's garden, Matt's Wild cherry tomatoes, Brandywine tomatoes, Mortgage Lifter tomatoes, French Merveille lettuce, Tapas peppers, pepperoncinis, jalapenos, sweet bell peppers, hibiscus, culinary sage, and blue potatoes that I saved from the summer crop. Already growing in the garden are kale, swiss chard, bok choy, pak choy, joi choy, scallions, onions, garlic, spinach, baby butterhead, romaine, red speckled lettuce (my lettuces have overwintered), arugula, and a variety of perennial herbs. As evidenced by this extensive list that will only grow longer as spring approaches, I am slightly obsessed. My friend recently asked me if gardening saved me money. My reply, "Not on food, but definitely on therapy." It is a chilly morning here, but should warm up some by the afternoon, so I'll try to sneak in some sun and pictures later. I'm jealous. Wish I had the space to grow all of that. 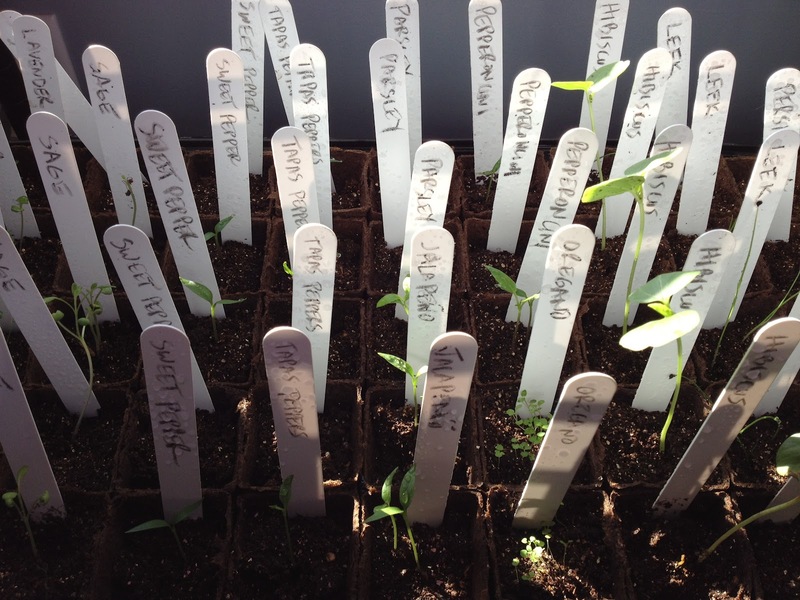 Really need to get on starting some seeds indoors to get a headstart on things even though I live in LA. Growing anything new this year? Many of those are new to me: artichokes, tapas peppers, leeks, parsley, tomatillos and several new tomato and lettuce varieties. I'm hoping the biodiversity will help lessen the pest and disease risks.